These partridge came from the local butcher, and were tucked in between the pheasant and rabbits. It’s officially autumn. Partridge aren’t as intensely ‘gamey’ as some of the larger birds. The meat is much darker than chicken, but isn’t as strongly flavoured as pheasant. It’s a nice compromise. A game bird for people who don’t really like game. Roasting a partridge takes about 25 to 30 minutes, the first half at a very high temperature (230c), the second at a more sedate 180c or so. Preparation is easy – salt, pepper, smother in butter. Resting the birds after cooking for a good ten minutes helps enormously. 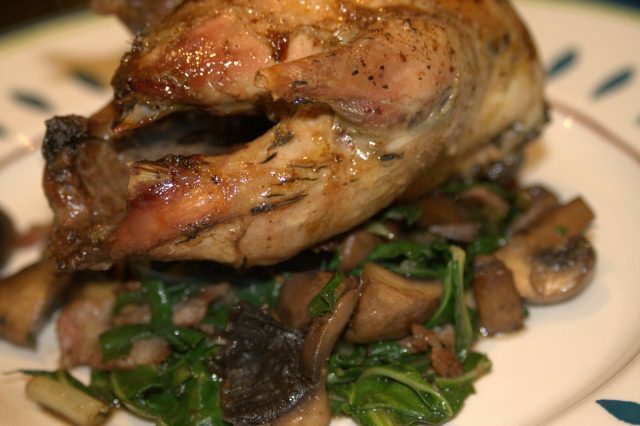 We ate the partridges with a simple saute of bacon, chard and mushrooms. Fry some chopped bacon in oil until crispy, then add some quartered chestnut mushrooms (they have to be chestnut, button mushrooms just won’t do). Wash the chard and remove any tough stalks, then slice the leaves into thin ribbons before shaking away any excess water. Add to the pan with salt and pepper and allow to wilt over a medium heat. Adjust the seasoning. Serve each bird on a bed of chard and pour over some of the pan juices. You could get fancy and make a sauce by deglazing the roasting tin with some red wine, but not on a Tuesday night. I loved this dish – a whole bird to yourself, to be picked over and gnawed at. Messy and satisfying. Jen thought it too ‘fiddly’, but she’s never really liked game anyway. Bonus leftovers for me!